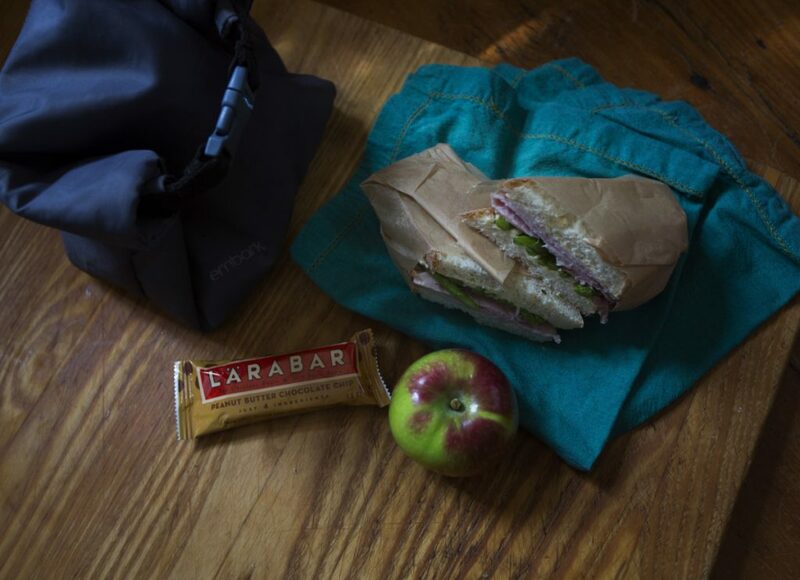 In the yes column, a lunch sack, a Thermos and leftovers. As my youngest child enters her senior year of high school, I find myself bracing for a long string of “lasts.” The last first day of school. The last back to school night when I get to meet the last round of teachers that will launch her into the next phase. The last home field hockey game. The last high school musical. I will miss all of these things come September 2019, I am sure, but will I cry when I pack my last school lunch bag the week before graduation in June? Yes, I think I will. I’ve been making school lunches since I was 12 when my early morning paper route got me home before my mother made her way down to the kitchen. I made those lunches then because if I could make sure I used up all the dreaded slices of chicken loaf in my four siblings’ sandwiches I could easily justify a much-loved peanut butter and fluff one for myself. Regardless of my motivation, in my lifetime, I’ve packed approximately 11,360 lunches eaten in six school districts, four states and two countries. While all have been packed in accordance with a balanced diet, only the last 2,000 or so have been packed with a sustainability mindset. I’ve won a few and lost a few during that run. Pack family favorites in reusable food jars and lunch bags for a healthier you – and a healthier planet. I’ve used the same dry-bag like Embark sacks I bought at Target six years ago for $4 each because they are washable, flexible, durable, sizable and lightweight. 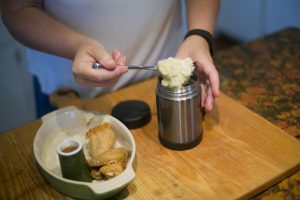 I found a couple of fabulous Thermos food jars big enough to hold the copious amounts of homemade food required to sustain a hungry teenager through afternoon physics classes. The model I prefer includes a handy collapsible spoon that snaps into place inside the cover so no plasticware is necessary. I’ve learned that teenagers consider a cloth napkin (rather than a single-use paper) tolerable, especially if I wrap it around an apple that subsequently makes it to the lunch table without a bruise. I learned the hard way that pricey multi-use beeswax coated paper designed to cut down on plastic waste gets tossed as easily as a Ziploc bag does in the rush to get to class after lunch. I’m working on convincing them that a reusable metal water bottle attached to the backpack is a convenient lunchtime drink as any. And I’ve come to be perfectly OK with individually wrapped protein bars because they sustain a body the last three hours of a 12-hour day that begins with band rehearsal at 6:45 a.m. and ends with basketball practice at 6:45 p.m. But the sustainable lunch-packing process that’s been burned into muscle memory in my house is that the task is merely an extension of dinnertime prep and cleanup duties the night before. Because I spend considerable time, effort and money making dinner a sustainable eating affair that the whole family can buy into every night, taking the steps to make it a meal and a half every night cuts cost, energy use and food waste. Recipes for some family favorites – spaghetti Bolognese, baked beans, and dumplings – can be easily doubled, packed away in their cooking vessels, reheated and packed in the aforementioned Thermos with no complaints. Buying a piece of protein that weighs 6 pounds instead of 4 gives me the same amount of (low sodium, preservative-free) meat for the same price I’d pay for cold cuts purchased at the deli counter. A Sunday ham and asparagus supper gives way to my daughter’s favorite lunch: ham, asparagus and Casco Bay Herb Butter sandwich. And it’s all wrapped up before I sit down to watch Masterpiece. A roast chicken and tomato, basil and mozzarella dinner easily transforms into a Chicken and Caprese Salad Sandwich, and it makes use of all of the bird as well as the season’s bounty. Given the story of the 4th Earl of Sandwich – an inveterate gambler who had a habit of sending for cold meat between two slices of bread so he wouldn’t have to walk away from a card game to eat – I know I am not the first person to espouse it as a vehicle for deliciously ridding your refrigerator of leftovers. I am merely suggesting that with a little forethought and a few leftovers, sustainable school lunches are in the bag.